UPDATE: due to anticipated high temperatures, the start time of the race has been moved to 6:55 a.m. Sunday. Please see this info sheet from the marathon with the latest updates. L.A. Marathon weekend is fast approaching and for those planning to go cheer on the runners, Metro Rail is the best way to get to the race route and all the festivities. Pre-marathon events kick off on Saturday, March 14, with the L.A. Big 5K at Dodger Stadium. Hoping to participate? Go Metro and save $5 on your entry fee by using our exclusive online code at checkout. For those watching the race, Metro Rail has several stations very near or along the course: Union Station (Gold Line, Red/Purple Line) is adjacent to the section of the race through Chinatown and Olvera Street, the Red/Purple Line Civic Center/Grand Park Station, the Gold Line Little Tokyo Station and these four Red Line stations: Vermont/Sunset, Hollywood/Western, Hollywood/Vine and Hollywood/Highland. The ASICS Los Angeles Marathon returns on Sunday, March 15 with the “Stadium to the Sea” course running once again from Dodger Stadium near downtown Los Angeles to Santa Monica and your best ticket to see all the racing action is to use the Metro Rail system. Metro Rail service will run as scheduled. Spectators are urged to ride Metro Rail to reach viewing areas and affected bus customers are urged to take Metro Rail to avoid bus detours and delays. Metro will run free, non-stop bus shuttles beginning at 5 a.m. between the City of Santa Monica and the Culver City Expo Line Station. Patrons can board Santa Monica-bound buses on Washington Boulevard just south of the Expo Culver City Station. Culver City-bound buses can be boarded at the temporary bus hub on Olympic Boulevard and 11th Street in Santa Monica. 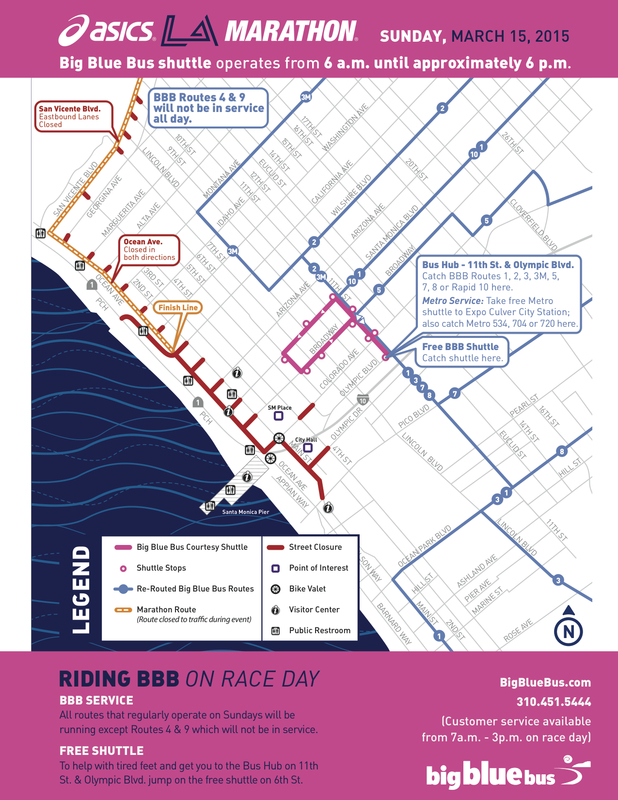 Santa Monica’s Big Blue Bus will operate free shuttles between the temporary bus hub and downtown Santa Monica, or it is just a 10-minute walk to the finish line. Metro Personnel will be available to assist customers at 7th/Metro Center, Vermont/Santa Monica Red Line Station, Culver City Expo Line Station, and the temporary bus hub at Olympic Boulevard and 11th Street in Santa Monica. In addition, valid Metro TAP card holders can save $5 on the entry fee at the LA BIG 5K pre-marathon event scheduled for Saturday, March 14, by using the discount code GOMETRO5K at checkout. The LA BIG 5K race will start and finish at Dodger Stadium. On Sunday, March 15, there will be interruptions in Metro bus service along the route. Lines normally passing through the marathon course will be rerouted and many other lines will be disrupted. Patrons are urged to plan ahead and allow for extra time during the race. 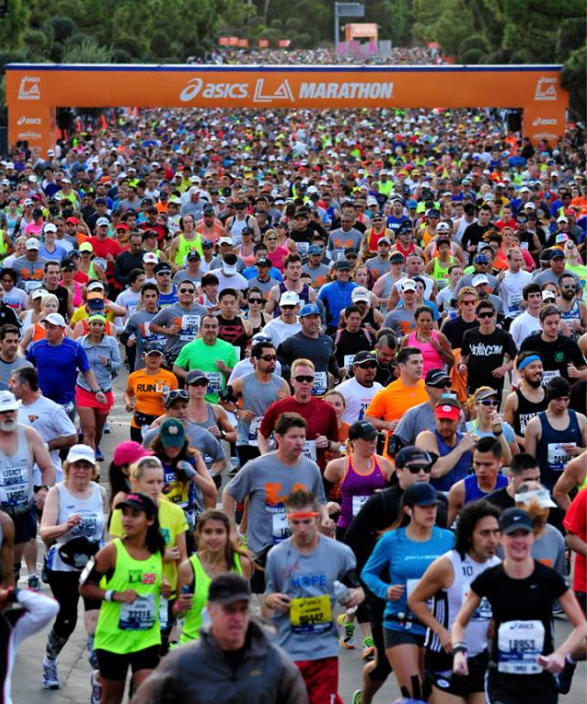 Numerous Metro bus lines will be impacted before and after the running of the LA Marathon. Those lines include: 2, 4, 10, 14, 16/316, 20, 28, 30, 33, 40, 45, 48, 55, 60, 68, 70, 71, 76, 78/79, 81, 83, 84, 90/91, 92, 94, 96, 105, 156/656, 180/181, 200, 201, 204, 206, 207, 210, 212, 217, 222, 485, 487, 534, 704, 720, 733, 745, 754, Silver Line (910). Regular service on some lines will be restored as the race progresses but full service on all lines is not expected to resume until the early evening hours. Metro apologizes for any inconvenience our patrons may experience on race day and appreciates their cooperation. For further assistance, please call 323.GO.METRO.